Yes, it really was a road trip kind of day - except we left the driving to Nabil, thank goodness. 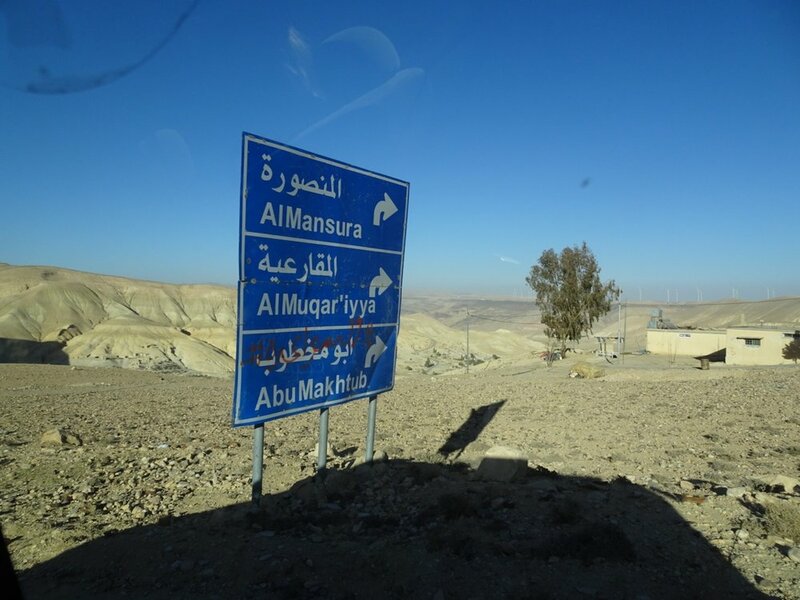 As we left the suburbs of Amman behind, we set out along the King’s Highway; the road which has enabled travellers to make their way between Amman (Philadelphia) and Petra for thousands of years. 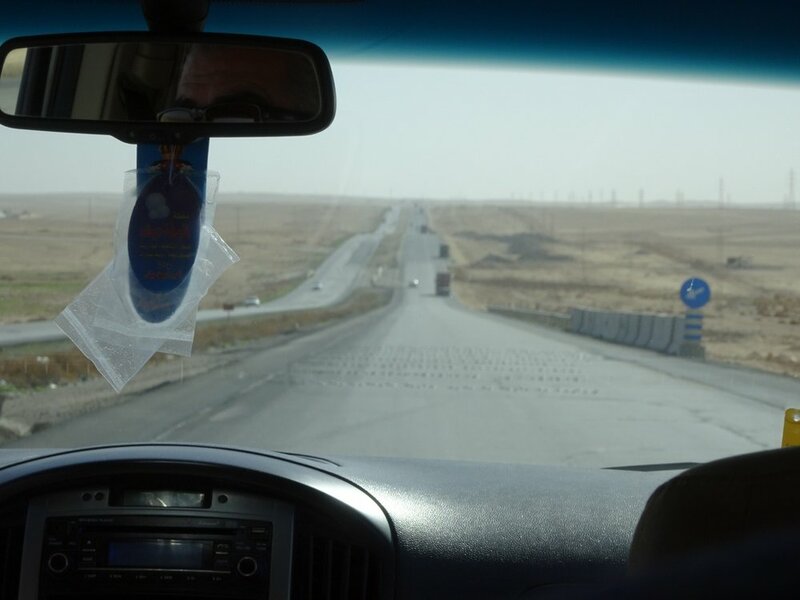 Today, it remains a busy route though mostly superceded by the more modern pan-Arabian highway between Turkey and Yemen. Initially, we were not going very far. 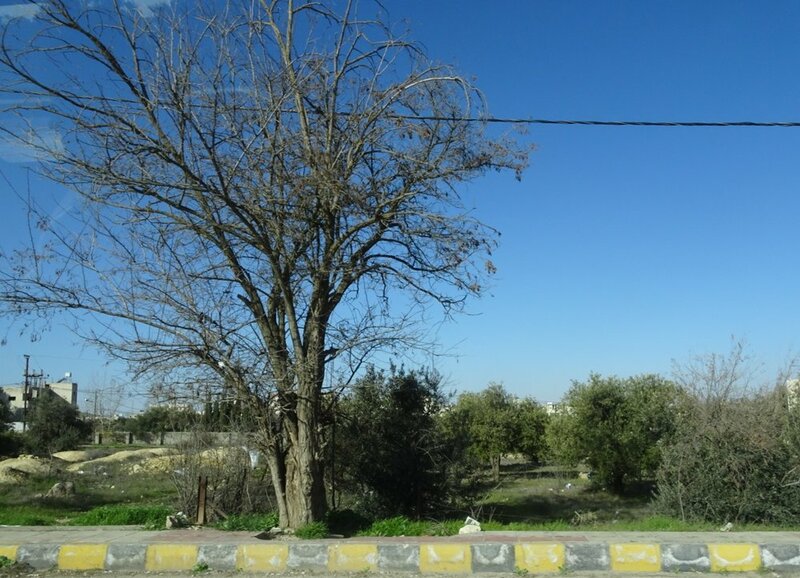 Our first stop was in Madaba, a bustling market town with a couple of places which feature on most visitor’s itineraries. 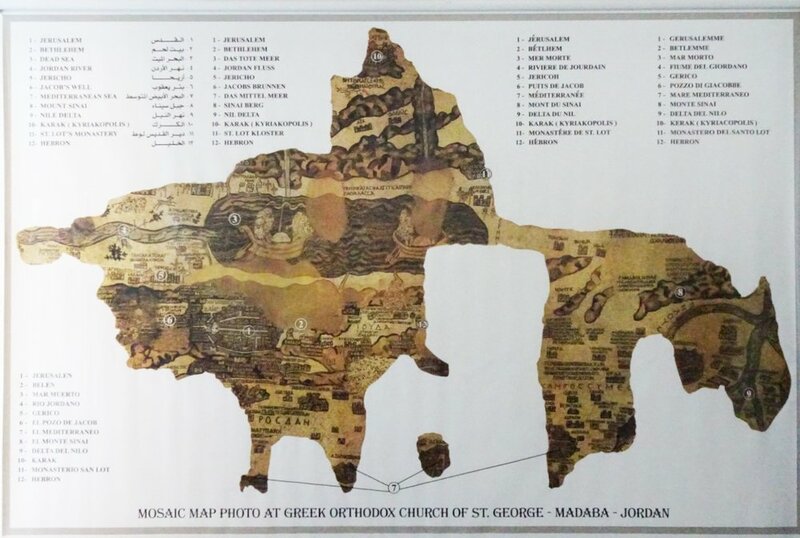 The first is the Greek Orthodox church of St George, otherwise known as the Church of the Map. 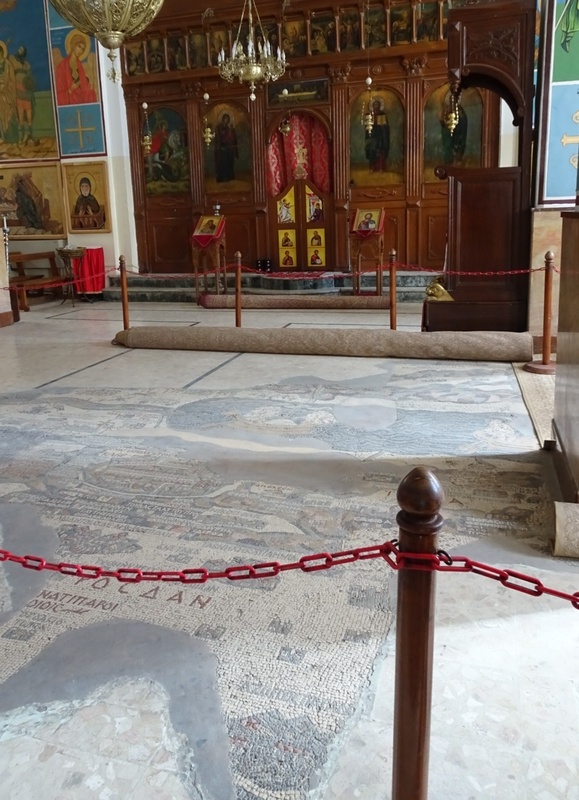 This part of the world has always featured on the path travelled by pilgrims and in Byzantine times a mosaic map was created to assist them in finding their way to significant sites on their route. Before we went any further, Mo suggested we take a look at a display nearby where he could point out a few features to us, because in the church itself, he wasn’t allowed to explain further. He explained the main places, clarified the layout and ensured that we’d get the most of our visit to this very popular visitor hotspot. 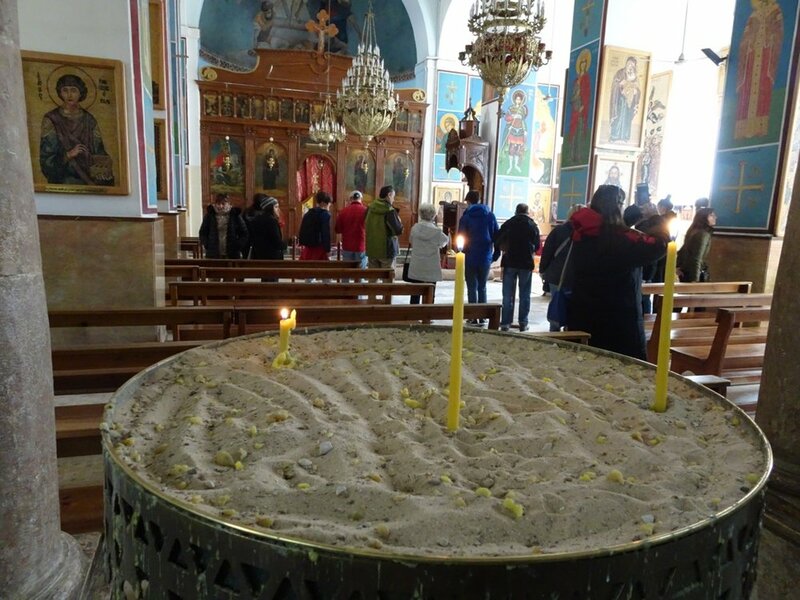 We were well prepared when we went into the church, then, although we were all surprised by the scale of the mosaic which was so much larger than any of us had imagined. We spent a while looking for those features we’d learned about, including the city map-within-a-map of Jerusalem. So much recognisable detail still to see, centuries later. It was really very impressive. We were very fortunate too, to avoid the crowds who were gathering outside the church, getting our own close up view of this wonderful artefact. Not only that, but Mo was able to pull back a rug to show us a little extra, normally hidden underneath a pew. I took lots of photographs, needless to say, and we called it a day as the first of the large groups came in. Excellent timing, Mo! 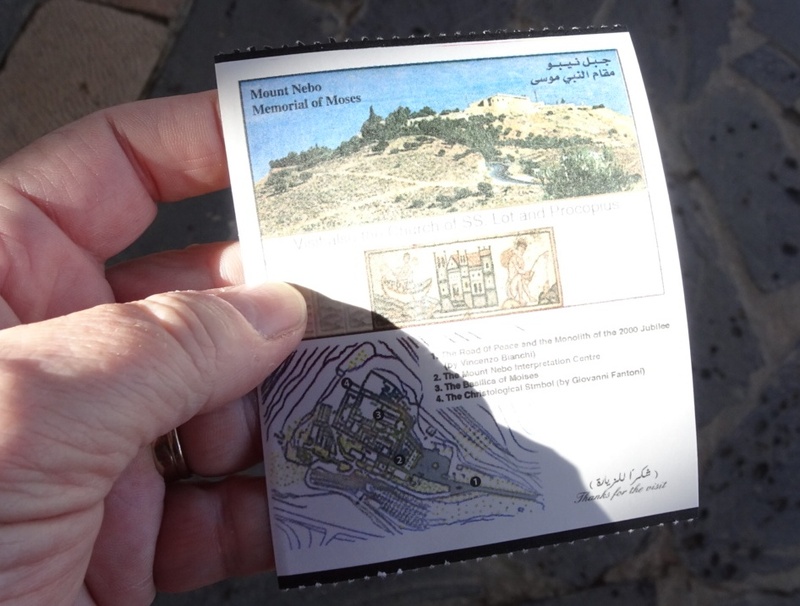 The other highlight of Madaba is nearby, out on a hillside: Mount Nebo, and it was here that we were headed next. Nabil parked the car high above a valley, where Mo pointed out the green area by the side of a bridge, the Ayoun Musa or Moses Spring. Here, Moses reputedly struck a rock and water came forth - it was not the first time that we felt a Bible might have been a more effective reference tool here than our Guidebook. 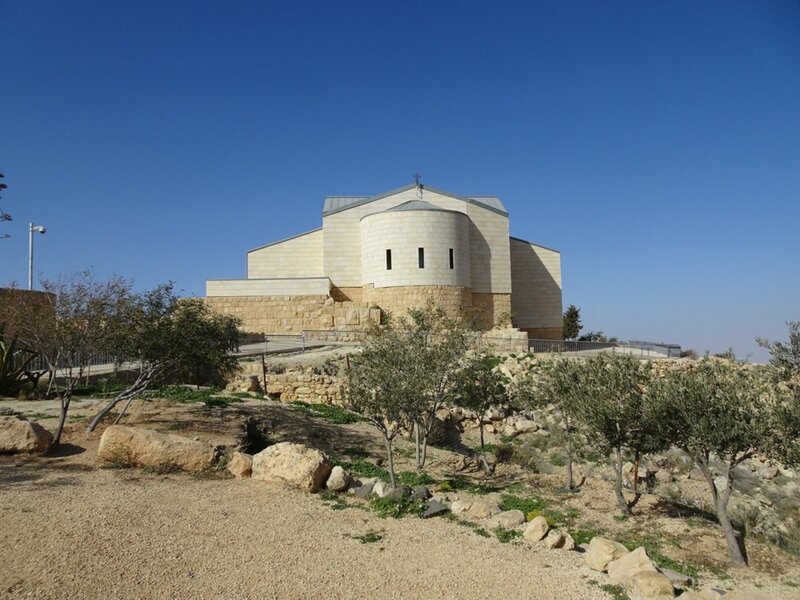 Mount Nebo itself was the place described in the book of Deuteronomy, where Moses led his people to look out over the Promised Land and, his work done, lay down and died. The church here is his memorial. 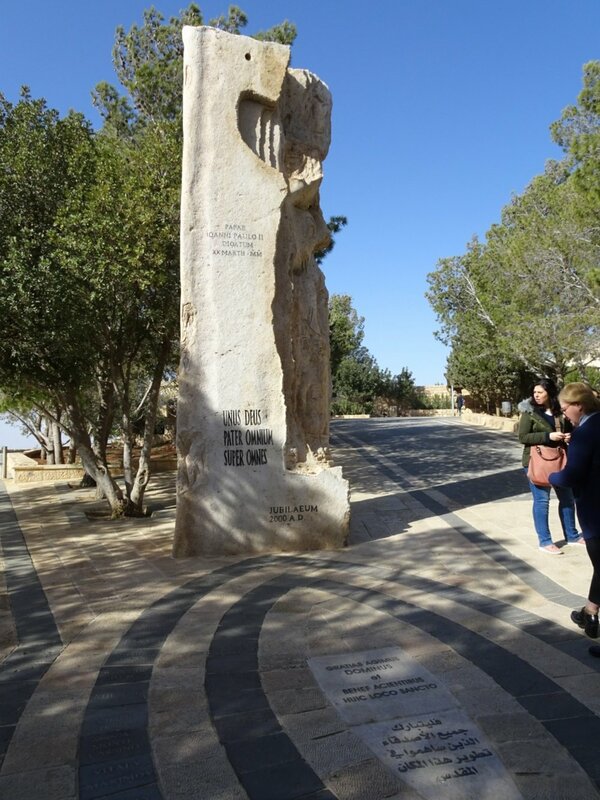 At the gateway to the site, a fine sculpture commemorates the visit to Mount Nebo by Pope John Paul II and a pathway to each side leads to the viewpoint and the memorial church itself. We stood awhile, taking in the vast country beneath us, trying to work out what was where, with the aid of a visual guide on the fence beside us. The names were all so familiar: Jericho, Jerusalem, the Mount of Olives, but our bible knowledge was sorely tested for sure. A modern, stylised cross with a serpent stands at the edge of the viewpoint, creating a striking focus and providing a symbol used throughout the site. 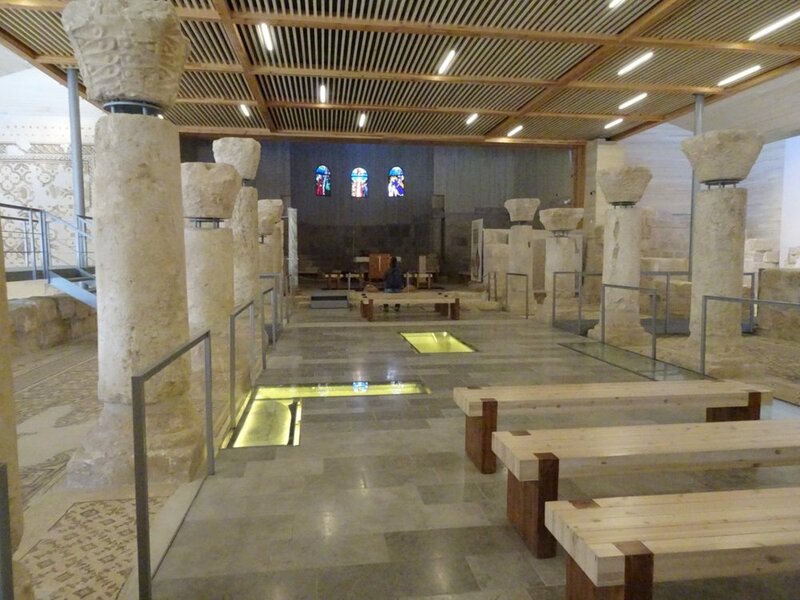 Recently completed, the Memorial Church complex houses a spectacular set of mosaics, some only recently discovered, all beautifully displayed and preserved. The modern church stands on the same site as several previous iterations, going back to classical times. The building itself is plain, open and simple; the adornments are the mosaics themselves, which are utterly breathtaking. Mo began by introducing the most important mosaic to us. This particular mosaic tells the story of the development of mankind in four simple but intricate lines: the first one, at the top, shows man as a primitive being with wild animals alongside. The second line shows him as a hunter, spear in hand, but in the third line of figures, he is farming, with domesticated animals and grafted fruit trees shown clearly. The fourth and final line of figures show man trading, leading exotic animals from other parts of the continent such as the zebra and the ostrich. Remarkable. Mo left us to explore independently, pointing out the ancient step-in font just to the rear of the mosaic we’d been viewing. Steel walkways gave us closer access to this and other parts of the church, so we pottered about for quite some time, marvelling at the countless small pictures and patterns to be found on almost every surface. Just around the corner was a small museum with a few artefacts and a greater number of larger panels interpreting the mosaics and other features of the memorial. Having had such an excellent explanation from Mo earlier, we didn’t spend long in there - just long enough to make sure we weren’t missing anything! From the calm, quiet design of the Memorial at Mount Nebo, we travelled just a few miles in distance but rather further in terms of taste and culture to the Mosaic workshop down the road. 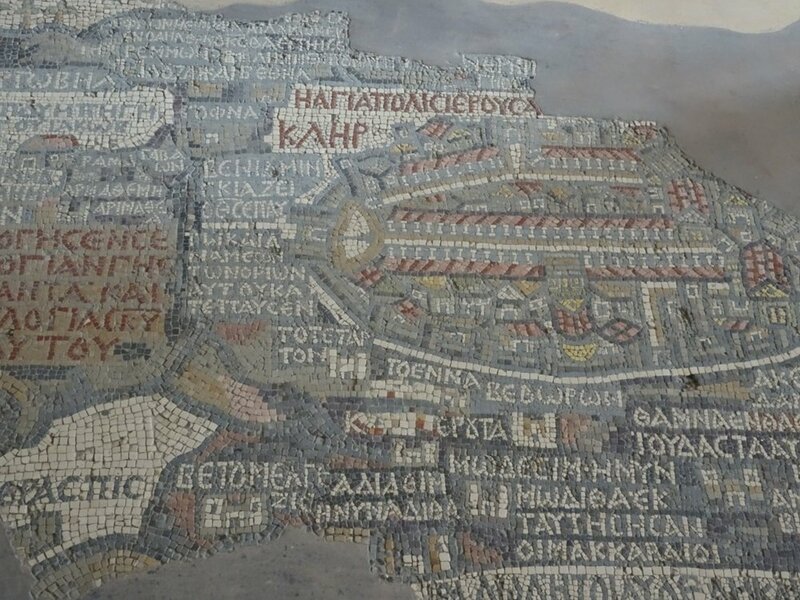 Clearly aimed at the tourist trade, a few artisans were recreating some of the mosaics we’d seen in a more practical format. 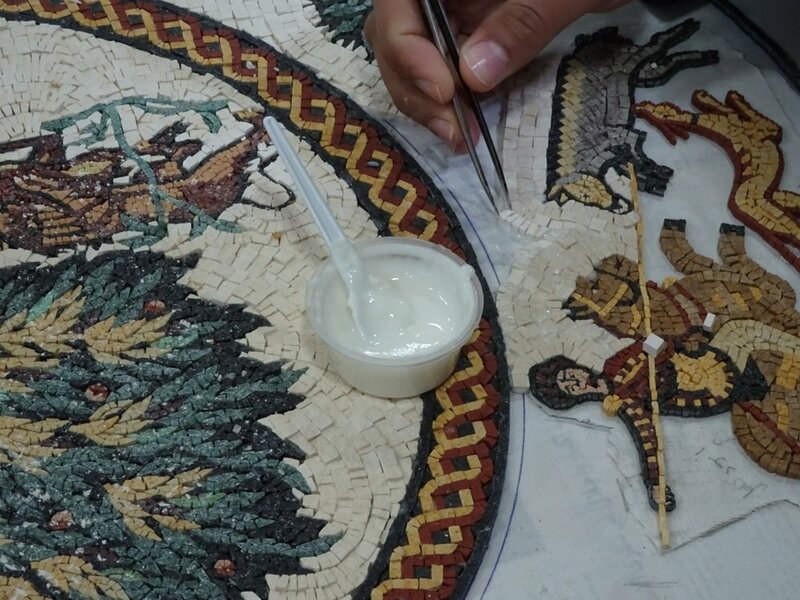 Yes, their work was painstaking and well executed: firstly, they places tiny shards of coloured rocks onto a piece of cloth following a traced design, adhering each piece with a flour and water paste. 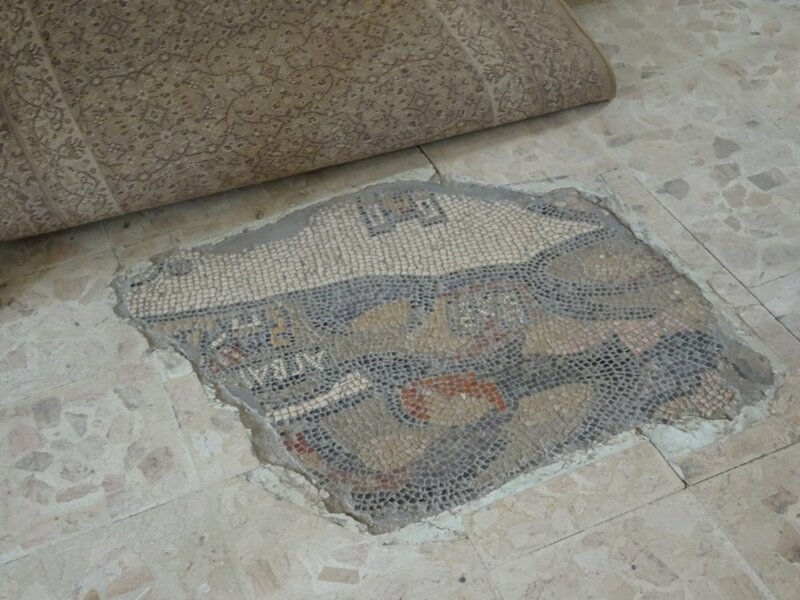 Having completed the design - which may take up to a couple of months - the cloth is turned upside down, the design fixed in a grouting medium and the cloth soaked away. As is often the case with such things, the finest pieces were lovely - undoubtedly, expensive - and the vast majority of the work for sale was pretty awful. Mosaic Elvis anyone? Back on the road then! 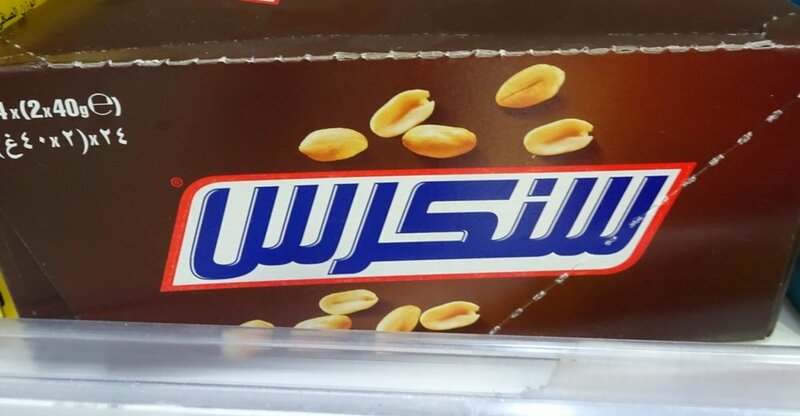 and there’s always a reminder of the power of branding in places like this. Back in the car then, for an afternoon nap or a few lines of knitting, heading further south along the highway towards Shobak - or Montreal as it was known here. There, high on a rocky outcrop was Shobak Castle, built by the Crusaders in 1115, one of several similar castles built during this time. Nabil drove us around a series of tight corners to the top of the hill where we climbed out and breathed in the chill, clear air. The limestone landscape is filled with caves and clear strata and small houses are built into the rock here and there. No sign of life here though - these places have long been abandoned. 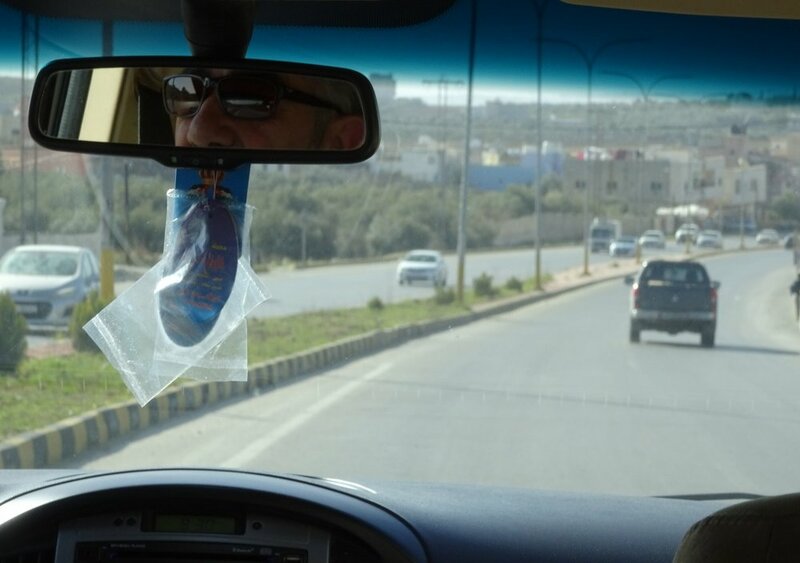 Actually, our eye was caught from time to time by what Mo jokingly referred to as “The National Bird of Jordan” - the plastic bag. No matter where we look, there is usually at least one in sight and at one point during the day, the landscape was filled with more plastic refuse blowing about than I’ve seen in a long time. We explored what remained of the castle, admiring the view and the sparkling sunshine. We had the place to ourselves save for the elderly chap selling a few old bits and pieces at the foot of the steps. We took a last look at the collection of carved stones and other small finds from the excavation before making our way back down to the car where Nabil was waiting for us. With a final look at the castle, we were on our way, driving just half an hour or so towards our destination for the next couple of nights, Petra. We reached the town of Wadi Musa in the late afternoon and checked into the hotel, right by the entrance gate to Petra itself. 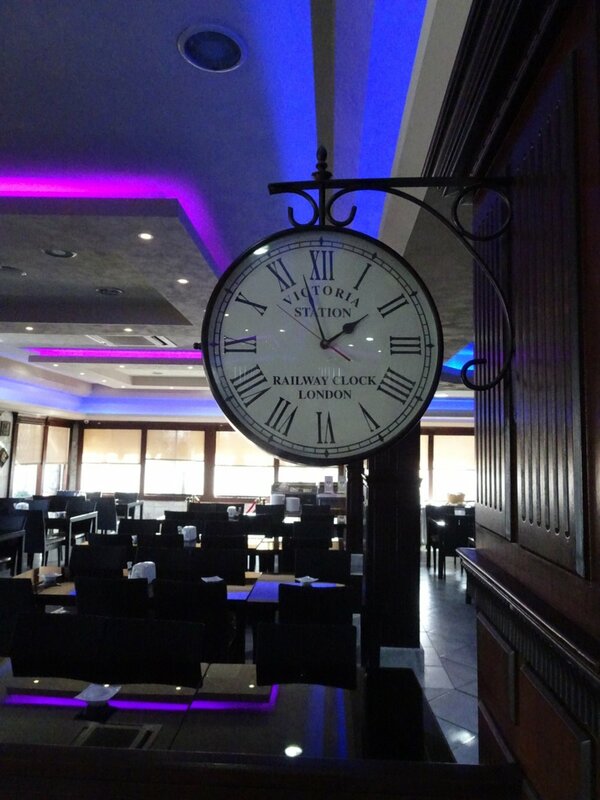 With fond memories of our last visit in 2008, we look forward to tomorrow!